This Aten asteroid, originally discovered in March 2000 was recovered at Great Shefford on 22/23 Feb 2003, almost three years later (see MPEC 2003 D16). 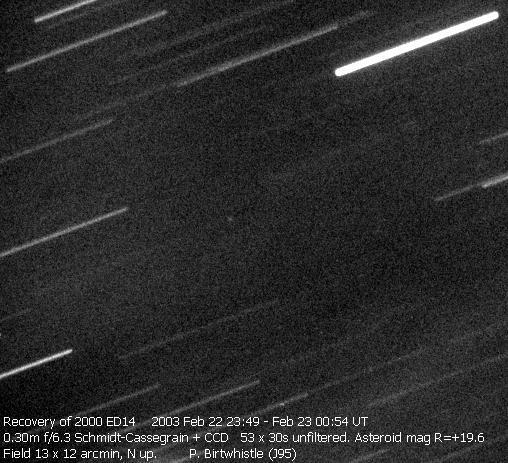 Following discovery by LINEAR, 2000 ED14 had been observed optically from 4-15 March 2000, the final position being from a radar observation from Arecibo on 20 March 2000. However the radar observation had not been included in the predicted ephemeris available from the MPC or from the NEODys system and by Feb 2003 the uncertainty in the ephemeris was of the order of 40 arcmin, along a line of variation extending SE and NW from the nominal ephemeris position. (It subsequently turns out that the radar observation had been used to improve the orbit but some internal problem stopped the orbit from updating the MPC Ephermeris Service). In planning the recovery, as an experiment I tried to see whether I could shortcut the search process using FindOrb from Bill Gray together with the original optical observations. Rejecting a handful of positions with the largest residuals that had been included in the MPC and NEODys orbits I used FindOrb to calculate a new orbit. Then using a new feature of FindOrb I produced a set of 586 'Monte Carlo' orbits by introducing a small amount of random noise into the original positions to give a spread of 'likely' orbits. These orbits were then integrated forwards and used to predict 586 current 'likely' positions, this giving a spread along the same line of variation, but shifted firmly to the NW side of the nominal MPC ephemeris position. The evenings of Feb 21 and 22 provided the first clear skies after the full moon and I started searching the line of variation to the NW side of the nominal position. After taking 360 fruitless images I started a run just before midnight 22/23 Feb that finally recorded the asteroid, about 20 arcmin NW of the MPC's predicted position. The recovery details in MPEC 2003-D16 included comparison of the astrometry from Great Shefford with the orbit solution that did include the radar observation from 2000 and my positions were -7.6" in RA and +2.5" in Dec from that orbit.